Our lad Cristiano Ronaldo was fashionably absent. So were his bros Mesut Özil, Sami Khedira, Álvaro Arbeloa, and Gonzalo Higuaín. Ángel Di Maria was out for doing the walk of shame during the clash against Deportivo la Coruña. The babes need to be fresh and so clean clean for Tuesday. You might ask why Jose Mourinho would bench some of his best men on a Clásico. Well, do remember that this is a match for La Liga. Real Madrid pretty much doesn’t have a shot at the title at this point. With 18 weeks left in the season, they trail behind Barcelona by thirteen points. And let’s admit it, aside from Barcelona’s recent flops, La Blaugrana is on a roll. 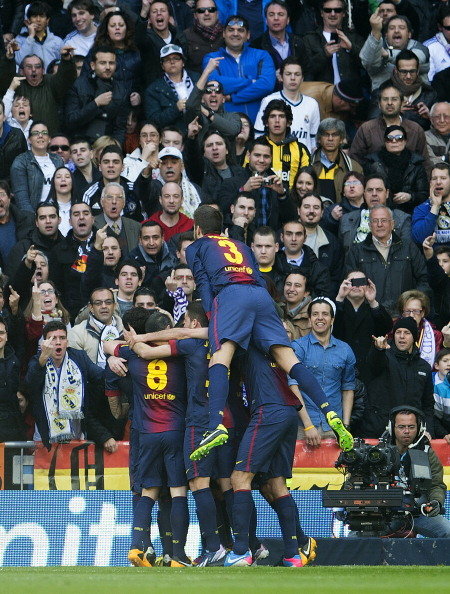 Although nothing is impossible, Barça practically has the La Liga title this season. But, Real Madrid does have a shot at the Champions League. In fact, they play English giants Manchester United in the second leg of the last 16 this Tuesday. Therefore, Mourinho planned to rest his boys so they can be fresh and ready for this very important game coming up. Instead, he placed Álvaro Morata in Ronaldo’s position and also allowed the 2007 Best Player of the Year Kaká a chance to contribute. I personally like the fact that Kaká has recently been given the opportunity to shine. The notably absent Blaugrana was Xavi Hernández. Xavi has fallen victim to a hamstring injury again, and will most likely be out for two weeks. The Stilettos of Fútbol wishes him a speedy recovery. Also absent was Carles Puyol. I’m already laughing. 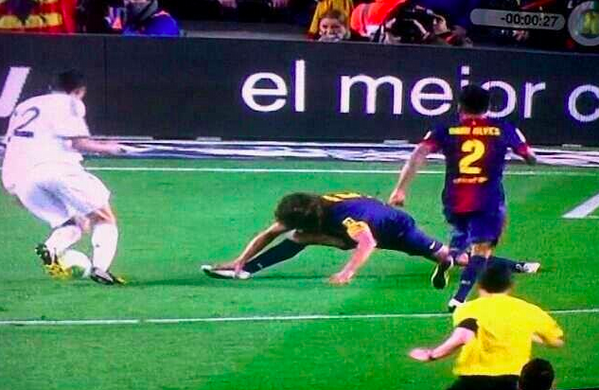 Poor Puyol was probably out with some serious groin muscle soreness after that massive splits he did this Thursday. Once again, please please please check it out. Sir Alex Ferguson surprised many by showing up to the Clásico earlier this week. Diego Maradona was present this time as Cristiano’s special guest. 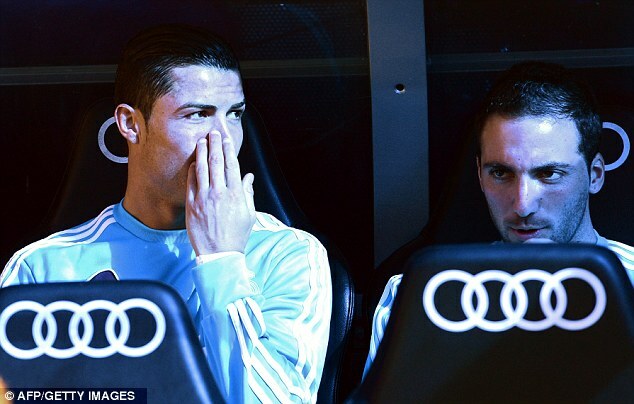 He even sat in Ronaldo’s private box with his new girlfriend. We had an early goal this time, with Karim Benzema scoring in the first six minutes. With an assist from Álvaro Morata that crossed Dani Alves, Benzema was able to evade Javier Mascherano and shoot the ball right past goalkeeper Víctor Valdés. Little Morata’s assists and shots were show stoppers. He missed a couple of clear chances to score, but a little polishing should do the trick. But in the 18t minute, His Honorable Royal Highness Lionel Messi finally came back to life. So yes, media, you can stop “looking for” the man now. With this goal, Lio broke a new record. 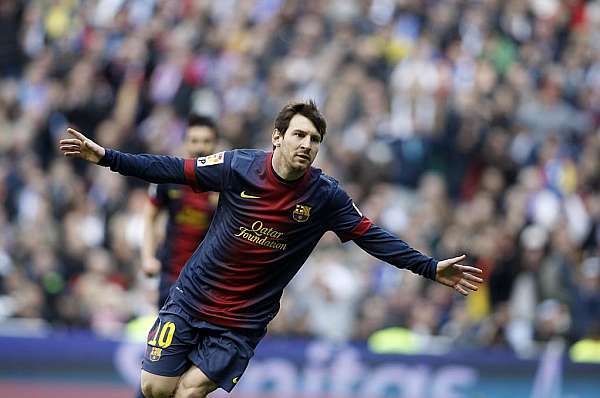 This is Messi’s 18th Clásico goal, which puts him level with legend Alfredo Di Stéfano. 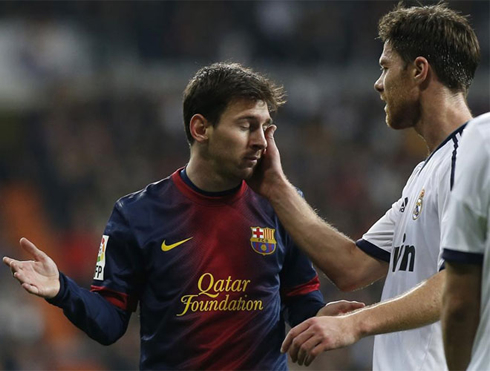 However, Messi accomplished this in 22 Clásico fixtures, unlike Di Stéfano’s 30. What’s more, it took Messi five years to do this, but it took Di Stéfano twice the amount of time to reach the number. Our eyes caught someone not celebrating the right way. Jordi Alba did some smack talkin’ to the Madridista fans. This image circulated all over the internet all day. No, sickos! It’s his index finger! In Jordi’s defense, he was being bulled by a not-so-nice crowd on the stands. Look at the home supporters instigating drama with a middle finger fest. The score was now an equal 1-1. As always, Barcelona started the second half on a strong note. Mourinho was forced to do some sweeping changes, and he had CR7 replace Kaká and Khedira replace Benzema in the 58th minute . Despite playing only 32 minutes, Ronaldo had more shots (6) than the Barcelona team (5) in the whole game (@RMadridGirl). Ronaldo was also the protagonist of a remarkable instance of drama. It seems like Piqué can’t get enough of Ronaldo. I mean, if Cristiano were in front of me, I wouldn’t resist either. 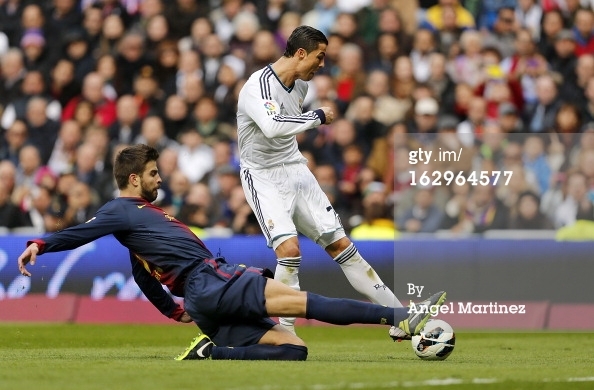 Earlier this week, Piqué tackled Ronaldo in the area, which resulted in a successful penalty shot for Real Madrid. This time, Piqué “challenged” Ronaldo again a minute into the latter’s entrance to the pitch. You be the judge of this image. Was it a foul or not? Either way, Piqué was booked with a yellow card. 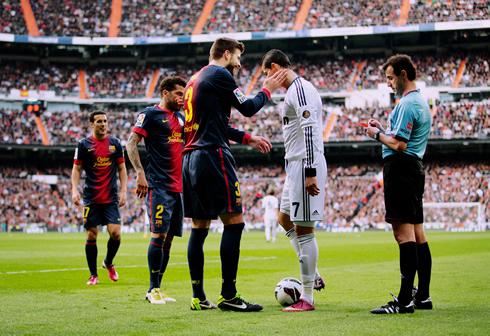 Piqué confronted Ronaldo and it seems as if he “slappingly” told him that he very well knows it was not a foul. But wait a mintute, don’t you think you’ve seen this gesture before? I found this video which shows the live action. It doesn’t seem as if Piqué’s hand ever actually touches Ronaldo’s face. The picture above gives an illusion. Despite all these side displays of affection, there was some real fútbol going on. In the 82nd minute came Sergio Ramos and sealed the Real Madrid victory. Although he is four inches shorter than Piqué, Ramos jumped higher than the Barça defender and converted Luka Modric’s corner kick into a fantastic header that shot right into the net. Now we get to the juicy point: Ramos’ the late challenge on Adriano. It was a clear penalty. Regardless of your team loyalty, you must recognize that it was a penalty. 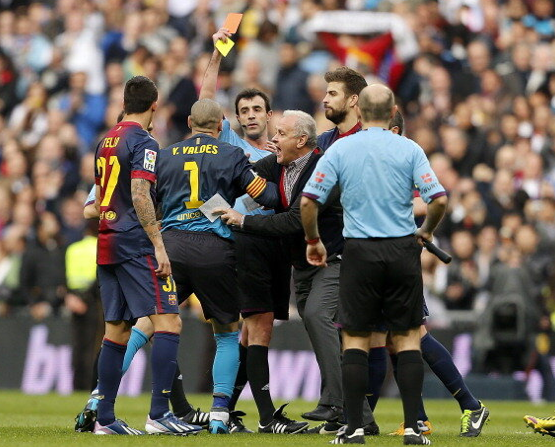 However, ref Miguel Ángel Pérez did not call it, and then all hell broke loose. Victor Valdés made a scene…again. I’m sure you’ve seen a toddler scream, kick, yell and cry at the supermarket when his/her mother refuses to buy that mega sugary cereal. I never imagined I would see something similar happen…in a fútbol pitch. Take a look at the force of this dramatic episode. Piqué can’t contain him, his own man can’t hold him, Diego López can’t calm him, and Sergio Ramos’ efforts are also futile. 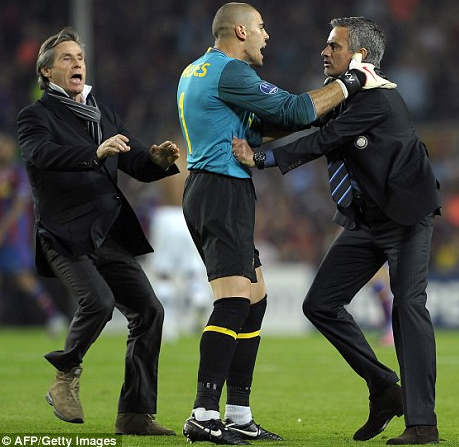 Then again, Valdés is known for his ineffective stress relieving techniques. Yoga helps too, you know. I think I’m going to follow my own advice and relieve some stress in the great outdoors. It feels like summer here and I can’t wait to soak up the sun at the beach. See ya soon!